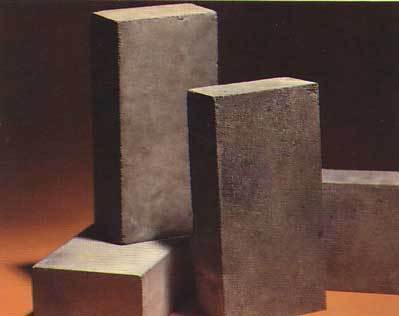 Silicon Carbide Bricks for Industrial Applications. These are specialized silicon carbide refractory bricks for high temperature industrial power plants and sintering applications. These are high quality, American Made refractories used in rotary kilns, high abrasion areas in coal fired cyclones and many other areas of power plant and other industrial applications.. Refractory shapes include precast cement and fused or sintered refractory products that are formed prior to installation in furnaces, boilers or other high temperature equipment. Refractories are hard, heat resistant materials and products such as alumina, silicon carbide, fire clay, bricks, precast shapes, cement or monolithics and ceramic kiln furniture. Refractory bricks, blocks, and tiles are stacked to form insulating furnaces, boilers or other thermal process vessel walls. Ceramics and refractories have high melting points are suitable for applications requiring wear resistance, high temperature strength, electrical or thermal insulation or other specialized characteristics. Call Tim at 888 774-2529 x20 for quote and to discuss your needs.